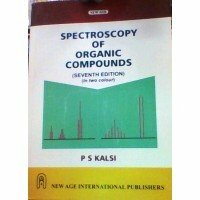 Table of Contents Spectroscopy Of Organic Compounds is a comprehensive book for undergraduate and postgraduate students of chemistry. The book comprises of chapters on the electromagnetic spectrum and the absorption spectrum, ultraviolet and visible spectroscopy, infrared spectroscopy, proton nuclear magnetic resonance spectroscopy, mass spectroscopy and optical rotatory dispersion. In addition, the book consists of several solved and unsolved questions for thorough revision and final practice. This book is essential for undergraduate chemistry students preparing for competitive examinations like NET, GATE, etc. About P. S. Kalsi P.S. Kalsi is the former Dean of Punjab Technical University and a professor of Chemistry. He completed his Ph.D degree from Poona University. Prof. Kalsi was invited by the Swedish Royal Academy of Sciences to submit proposals for the award of the Nobel Prize for Chemistry for 1985.